In a two-hour documentary special, Ben Fogle and Ellie Harrison embark on a remarkable adventure in search of marine giants that visit the British Isles every year. From Fin Whales the size of buses to 3-metre long predatory sharks, the pair come face-to-face with some of the ocean’s most elusive and spectacular wildlife, witnessing the very first whale-fall experiment to take place in the UK, observing what happens when a 7-ton humpback whale dies and drops to the bottom of the ocean. Whales are the largest and most majestic creatures in our oceans. When one of these beautiful creatures dies, it gives one final gift to the ocean. A single whale can feed more than a million mouths, drawing creatures from sharks to killer whales to the feast. OPERATION WHALE reveals how this great ocean event is vital to the marine food chain as an array of cameras (including deep sea robotic vehicles) chart the diverse range of marine life that visit the carcass, including scores of Blue Sharks. While Ben watches the whale feast, Ellie dives the neighbouring Pembrokeshire and Lundy coasts to explore what other life is here, including metre-long Barrel Jellyfish, dramatic bait balls and Leatherback Turtles. Off the coast of Ireland, we meet 70-foot Fin Whales, the world’s second largest whale, whilst off Wales bubble netting Humpbacks feast on the abundance of tiny plant and animal life. Other marine life showcased across this special include Basking Sharks, Sperm Whales, Minke Whales, dolphins, Mola Mola and huge tuna. The humpback for this experiment was donated by the Scottish Marine Animal Stranding Scheme (SMASS), which was unable to save the 30-foot female when it was found entangled in fishing lines near Helmsdale in the north east of Scotland in June 2015. She was on her way from Cape Verde Islands off West Africa to feed on herring off Norway when she became entrapped in nets. Her poignant story has a bigger context of the remarkable journeys ‘giants’ undertake through the UK’s waters. Filmed in a high energy style, OPERATION WHALE provides viewers with a unique glimpse of Britain's hidden marine life and the remarkable journeys marine visitors make to these waters. It offers a rare mix of adventure, beauty and revelation. Ben Fogle and Ellie Harrison go in search of Britain’s whales and sharks. More than 25 kinds of whales and dolphins and over 30 different sharks either visit or live in our waters. Fin whales the size of buses and 10-metre Minke whales are just some of the giants that visit the British Isles, many undertaking extraordinary journeys to reach our shores. But despite their size, relatively little is known about their lives. The team plan an extraordinary expedition to the Celtic Deep, a little known area of water sitting between the Cornish, Welsh and Irish coasts to go in search of whales and sharks. But to find sharks they need some help. Since whales were protected in the sixties their numbers on the rise, and more and more are washing up on our beaches. “In the 25 years since the ‘UK Cetacean Stranding’s Investigation Programme’ (CSIP) has been going, there’s been 12,000 stranding’s, that’s about 600 a year in the UK” says Rob Deaville who runs CSIP. “When a whale dies, it’s an incredibly important ocean event that feeds thousands of mouths. In the UK most get taken to landfill” says whale-fall expert, Nick Higgs. “Now, for the first time in British waters, we’re hoping to find out who comes to the feast”. In late spring, a call comes in that a 9 metre humpback has drowned, entangled in lobster pot lines off the village of Helmsdale in NE Scotland. “The sea conditions picked up to a point where we couldn’t get out to sea at all” says Alistair Jack from the British Divers Marine Life Rescue. “Everything in nature was against us to try and save this animal. We suspect it drowned at high tide. It’s quite heart breaking”. As Ellie Harrison heads for Scotland, the news leaves her with quite mixed feelings. “It’s so sad this animal has died, but it could also be the perfect specimen for our project”. Humpbacks are slow swimmers and especially vulnerable to getting caught in lines. “She shouldn’t be here, upside down in a harbour wrapped in rope” says Andrew Brownlow who’s part of the ‘UK Cetacean Stranding’s Investigation Programme’. “She should be out there feeding normally but we can hopefully learn something from this so it’s not a total waste”. As sea temperatures warm, more and more of our summer visitors start to arrive. Soon, the ‘Helmsdale whale’ will give the ultimate gift of life back to the ocean. All around the British coast, more and summer visitors are starting to arrive. Britain’s commonest whale; 10 metre Minke whales are spotted all around the coast, where they’ve come nobody knows. And more humpbacks are arriving. Padraig believes the waters off Kerry are becoming a real hotspot for humpbacks with more than 30 being seen here every summer. From the air, we see exquisitely beautiful whirls of bubbles rise from the deep, as the humpbacks release a net of bubbles to trap fish.“ I cannot tell you how amazing it is to see its mouth coming up creating this ring of bubbles, I’m actually deeply moved out here” says Ben. As the waters reach 17 degrees Celsius, it’s peak time for our summer visitors and time to take the ‘Helmsdale whale’ back out to sea. As a lorry weaves its way through the North Devon countryside, with an extraordinary cargo inside, Ben and Ellie, with a team of whale-fall and sharks experts, are about to embark on a remarkable expedition to the Celtic Deep. Ellie leaves first on a converted trawler, ‘the Lady Kate’ to explore the tiny islands lining the Pembrokeshire coast. Her plan is to meet with Ben and the whale in the Celtic Deep in 24 hours’ time. As she passes the tiny island of Grassholm, she meets some of the first creatures they could meet again in the Celtic Deep. The 4th largest gannet colony in the world, Grassholm is home to more than 80,000 birds. As Ellie heads on towards the Smalls, a treacherous outcrop of rocks lying some 20 miles offshore, she has a magical encounter snorkelling with grey seals. “That was one of the best experiences I‘ve ever had” says Ellie as she watches seals playing in the water around her. Travelling up to a hundred miles on their fishing trips, we could soon meet them again in the Celtic Deep. As Ben and ‘the whale’ leave from North Devon, the UK’s first ever ‘whale-fall expedition’ is underway. “The dream would be if we got some sharks. That’s not to say I’m not anxious and nervous about the whole thing, particularly diving in very deep waters with British Sharks” says Ellie as ‘Operation Whale’ gets underway. Ben and Ellie are about to encounter the largest gathering of sharks ever seen in British waters. “I’ve got to pinch myself that this is actually happening” says Ben Fogle as an extraordinary expedition to the Celtic Deep; an area of deep water sitting right between the Cornish Welsh and Irish coasts, gets underway. Floating behind the ship, is 9-metre humpback whale, its life tragically taken when it got caught in lines and drowned. Since whales were protected in the sixties, their numbers are on the rise and more and more are being found. “When a whale dies, it’s an incredibly important ocean event that feeds thousands of mouths. In the UK most get taken to landfill” says whale-fall expert, Nick Higgs. “Now, for the first time in British waters, we are going to find out who comes to the feast”. “Britain has more than 30 different kinds of sharks including some real megastars. We’ve got hammerheads, we’ve got blue sharks, we’ve got threshers, we’ve got Mako’s and they’re out there every summer,” says shark expert, Richard Peirce. ”This is my best chance of finding who’s out there. I’ve been dreaming about this forever" says Peirce as the expedition begins. It’s been one of the worst summers on record, and while the team have chosen what’s meant to be a relatively calm window between two lows, but the seas are still big. En route to the Celtic Deep, Ben takes shelter, behind the tiny island of Lundy, 12 miles to the north of Devon until the seas calm. His first dive is in the UK’s first Marine Conservation Zone. Teeming with life, he spots his first shark, an egg case with a tiny shark growing inside! It belongs to a nurse-hound, one of our commonest sharks that grows to well over a metre. “So here’s the big mystery” says Ben.” We’ve got seals everywhere, they’re perfect snacks for great white sharks, so where are they?” “Not here, I really wish they were” replies Peirce as the two watch Lundy’s grey seals frolicking in the water. “We’ve got seals, we’ve got water temperature, we’ve got everything. It would really make my life to see a great white in British waters!” The nearest confirmed great white sighting was 200 kilometres away off the coast of Brittany. The whale-fall experiment is Richard’s best chance of seeing who’s out there. “For me, who’s been looking for sharks in British seas for the past 20 years, to actually have an opportunity to watch a whale being eaten by sharks, to attract big sharks is mind-blowing” says Richard. The next day Ben Fogle and Ellie Harrison are floating 50 miles from land with the whale floating behind, mimicking exactly what happens when a whale dies at sea. “Shark” shouts Peirce as their first visitor, a 1.5 metre blue shark breaks surface. Travelling from as far away as the east coast of north America, its mostly females and young blues that ride the Gulf Stream east to feed in our rich waters every summer. After an average journey of 1700 miles finding the whale must be like winning the lottery. “We’ve got two circling!” says Ben as he gets in the water. Blue sharks have been responsible for four recorded fatalities, the divers need to be extremely careful, we’re in their world and with so much food around they at their most dangerous. Ben watches as more than 15 million calories of whale are slowly being recycled. We see some of the largest blue sharks, at 2.7 metres, ever filmed in British waters. “That was just extraordinary. It’s like another world down there” says Ben post his first dive. Twenty four hours after arriving in the Celtic Deep the team see more sharks than they can ever imagine. It’s now too dangerous for the divers, and they deploy an ROV to watch the sharks from the surface. “This is absolutely breath-taking! Have you ever seen it like this in British waters before” says Fogle as he watches the sharks live on a monitor. “No!” says Peirce. From the air, sharks race in from all directions. Underwater, they’re stacked all the way down to at last 30 metres. We are witness to a major feeding event. One of nature’s great spectacles and happening here in UK waters! We estimate, at it’s peak, over 200 sharks join the feeding frenzy. “I would never have predicted you’d have had this many sharks eating this much of the whale at the surface” says Nick Higgs. As bad weather closes in again, the team have to cut short their expedition and sink the whale. ‘Whale-fall’ is reached at 86 metres; it’s final resting place the Celtic Deep. Over 4 days at the surface we estimate she’s fed at least 200 mouths, some 15% has been eaten, and over 2 million calories has given new life to the sharks. Now it’s the turn of the creatures living on the seabed. Whale fall expert Nick Higgs leaves a time-lapse camera, it will take a photo every hour for the next six months. He’ll come back to monitor the whale for years to come. 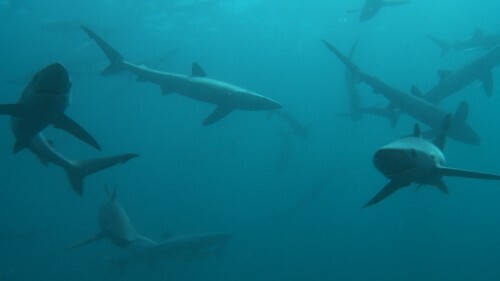 Britain’s Sharks is a ground breaking, intimate adventure which captures unique scenes of the biggest gathering of sharks every seen in British waters. The program profiles 6 of Britain’s sharks, and introduces the viewer to some of our more exotic visitors like leatherback turtles to swordfish.